View through the lens inside the black box on the window on the right. 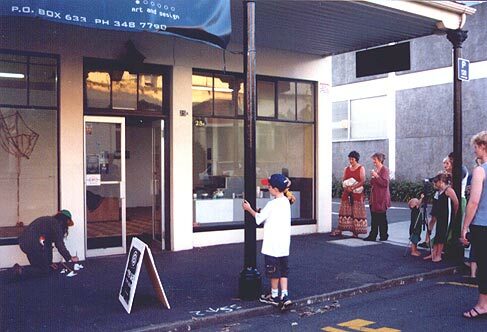 Drews Ave, Whanganui, January 2002. The small black square in the front window is a small box by Jaqueline Wassen, with a tiny lens pressed against the window. Peep through this (see detail above) and you see a domestic space. 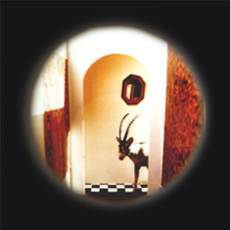 It is seemingly a miniature interior but with a visitor unnaturally out of context and scale. by Sen McGlinn (workman), Jacqueline Wassen (made the panels) & Sonja van Kerkhoff (concept). 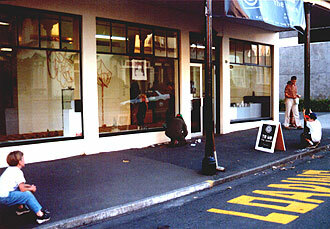 Performance during the opening, 1 January 2002, where Sen made attached these labels and painted the 'spaces'. The piece remained for the rest of the exhibition. 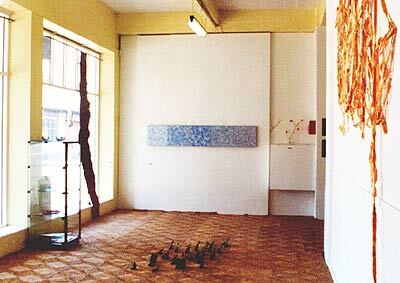 for a larger view Left to Right: Tree form (black vinyl) and four transparencies by Joke Elzinga, painting by Liz Coats, plant forms by Jacqueline Wassen (Click to view this work), Sweet Sixteen, textile by Natalie Muller, (Click to view this). 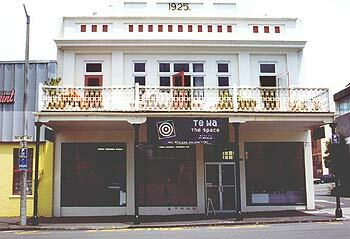 Some work is intended to be viewed from the street. 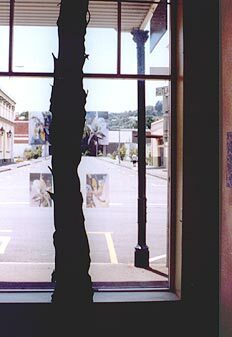 Joke Elzinga's paintings on transparent sheets placed are against the window so the abstract forms and colours are like thin membranes in contrast to the dark silhouette of a vertical tree trunk. 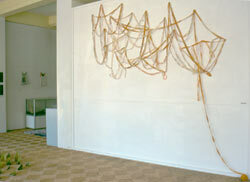 Natalie Muller's work relates to her own childhood. "Sweet Sixteen" consists of long threads of cloth which have been meticulously sewn and reworked with various textiles and paper incorporating texts from a letter she wrote as a teenager. Inspiration by Sonja van Kerkhoff and Sen McGlinn. On the floor a cluster of green shoots, (the work "Inspiration") seem to be sprouting through, like spring's affirmation; a faith in renewal. 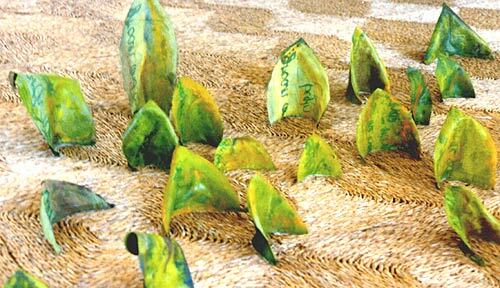 Each leaf is a micro-painting on shaped cotton, with words from the poem "New Vessels" by Sen McGlinn. Among the texts we can read "Earth turns / the river in the stars / is gathering strength for the thaw." Sprouting grass and flowing words also appear on the interactive Cdrom, "Dans le jardin des beaux arts" which also has sound and video clips and animated drawings by a few of the artists in this exhibition. Jessy Rahman's two cloth hangings are enlargements of micro-organisms, but in soft materials so that the floating forms look like free-form cushions. 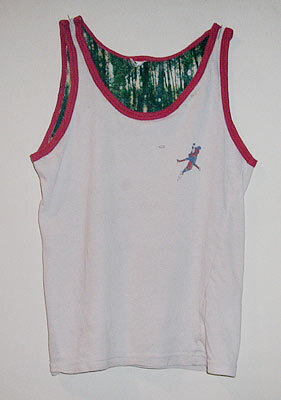 In Children of Tāne there are glimpses of a pine forest within the body of out-grown children's singlets. In France, where this photo was taken, pines are natives and the forests have a naturally evolved ecology of vines, insects and birds. However, on close inspection of the trees, you see birdhouses, which are from another artwork (Strictly for the Birds) by Sonja van Kerkhoff and Sen McGlinn. 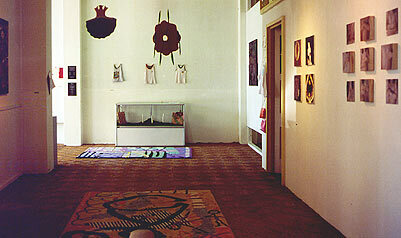 Most of their work in this show relates to their children. "The Gesture" consists of nine squares showing a child's torso and hands engaged in making the sign of the cross. These images and the texts on four of them raise questions about what happens or could happen physcially and spiritually when you making a gesture such as the sign of the cross. Another work, "Small Ones", juxtaposes a child's limb with text.